No 8th Australian Commonwealth Horse, West Australia, casualties. 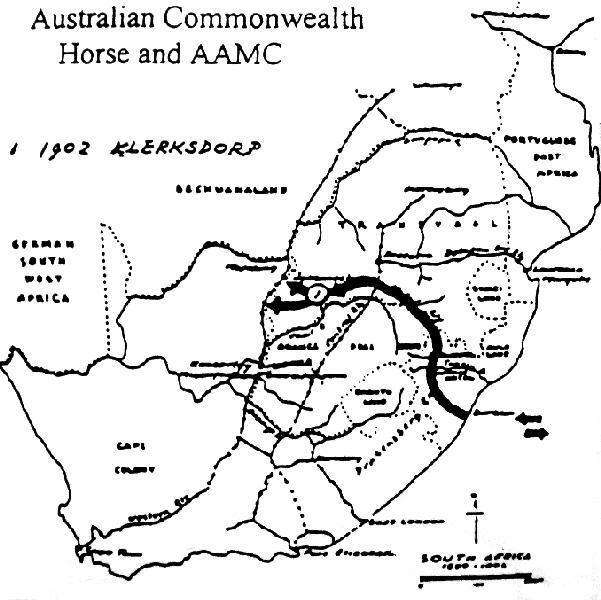 Murray, P. L., Official Records of the Australian Military Contingents to the War in South Africa, p. 437. This was "D" Squadron of the 8th Battalion, Australian Commonwealth Horse, which comprised two South Australian squadrons, one Western Australian, and one Tasmanian. For particulars of pay, clothing, equipment, conditions of enrolment, organization, etc., vide 5th Battalion, Australian Commonwealth Horse, New South Wales, page 184. No. 1 Troop comprised 29 N.C.O. 's and men, who were enrolled at Military Head-Quarters, Perth; No. 2 Troop of similar strength, enrolled at Geraldton (6), Bunbury (14), Northam (8), and Albany (3); Nos. 3 and 4 Troops, each of strength stated, at the Eastern Goldfields; enrolling centre, Kalgoorlie. Preference was given to men belonging to existing military units, to those who had served in South Africa, and to civilians that possessed most military qualities. Horses fit for service were selected by local committees, at prices not exceeding £20; Preference Wing given to horses brought by the man enrolled. Height, 15 to 15.3 hands; age, 5 to 12 years. For service, vide 8th Battalion, Australian Commonwealth Horse, South Australia. There were not any casualties. Promotions as per nominal roll. The Squadron embarked on the transport St. Andrew (which had on board the battalion staff and the other Squadrons), at Fremantle, and June, 1902, and arrived at Durban on the 19th. Strength:- 4 officers, 116 others, with 120 horses. Forty seven N.C.O. 's sad men were struck off in South Africa; 4 officers, 69 others returned to Australia. Murray, P. L., Official Records of the Australian Military Contingents to the War in South Africa, pp. 437 - 440.